Prime Minister Shinzo Abe said July 17 that the government will scrap the costly design of the New National Stadium, the main venue for the 2020 Tokyo Olympics and Paralympic Games, and return the project to the starting blocks. 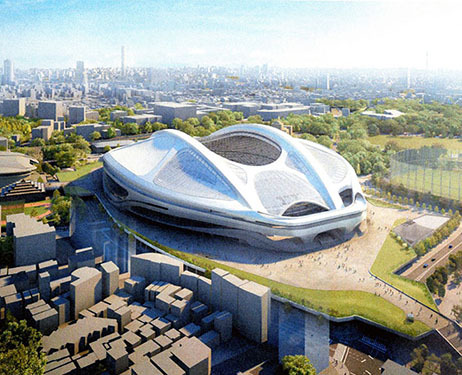 Abe admitted that the government held discussions to determine if it could revise the stadium blueprints, designed by London-based Iraqi architect Zaha Hadid, over the past month. Estimated construction costs for the original design have ballooned to 252 billion yen ($2.032 billion) from the initially planned 130 billion yen, due to its radical design involving two massive streamlined arches. “We made the decision today, as we reached a conviction that we can definitely complete the construction by the time of the Olympic Games (even after the government picks a new design),” Abe said. Before the announcement, Abe met with Yoshiro Mori, former prime minister and president of the Tokyo Organizing Committee of the Olympic and Paralympic Games, to seek his understanding for scrapping the original design. Mori agreed to give up a plan to use the new stadium as a venue for the 2019 Rugby World Cup in Japan.